After a hard days work and posting about the phenomenal Galway Bay by Mary Pat Kelly about Irish immigrants in honor of St. Patrick’s Day. I decided to do a little searching on the Internet for some local fun. Lo and behold, I discovered our Green Turtle was hosting St. Patrick’s Day celebrations with green beer and $2 pints, including exports like Guinness. 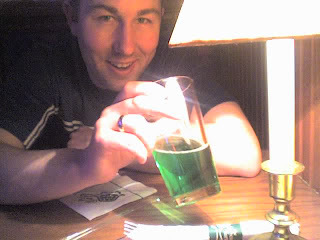 Here’s my husband enjoying his Green Miller Lite; I had a sip, but thoroughly enjoyed having my $2 pints of Guinness. Well, this place was full of St. Patty’s Day fun and green. The waiters and waitresses were wearing St. Patty’s Day shirts, green necklaces, fez hats, and elf ears?! My hubby just had to have some. Check him out. 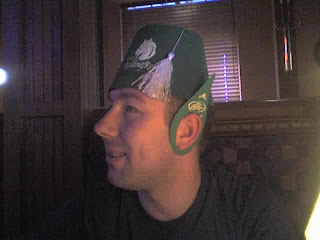 I was wearing my green Celtics hat with its shamrock glory and my green shirt and shamrock socks! I think I was decked out enough for the occasion, but the manager offered me a hat and ears to take home as well. How was your St. Patrick’s Day? What did you end up doing? 1 gently used ARC of Reading by Lightning by Joan Thomas; Deadline is March 20 at Midnight EST.